Kampachi Farms has successfully conducted two state-of-the-art offshore aquaculture trials in Federal waters around Hawaii. These trials tested numerous technologies necessary to take aquaculture “over-the-horizon.” The Velella Beta test involved use of an unmoored, copper-alloy meshed Aquapod®, stocked with around 2,000 kampachi, attached only to a feed barge / tender vessel, which drifted with the currents, between 3 – 75 miles offshore of the Big Island. This was the world’s first unanchored net pen trial, and was awarded one of TIME Magazine’s “25 Best Inventions of the Year” for 2012. The Velella Gamma test used the same net pen, species and number of fish, but included a single-point mooring located in 6,000 ft deep water, some 6 nautical miles offshore of the Kona Coast. This trial used a remotely-controlled, unmanned feed barge to facilitate “over-the-horizon aquaculture”. Technicians could run the farm remotely, using an iPhone or iPad, and only needed to visit the site once a week to top up the feed in the hopper and the fuel in the generator. The Velella Beta and Gamma demonstrated the potential of open-ocean aquaculture to produce outstanding finfish, while having no significant impact on ocean ecosystems. As part of a national initiative to increase U.S. aquaculture production in the next four years, Kampachi Farms has been awarded a grant in partnership with Florida Sea Grant to trial a new Velella net pen pilot project in the Gulf of Mexico. Read more about the Velella Epsilon project. Kampachi Farms also conducts industry-leading sustainable feeds research, focused on reducing our reliance on fishmeal and fish oil from wild stocks, and instead using scalable agricultural proteins and oils in fish diets. We think of this as “softening mankind’s footprint on the seas”. We have conducted dozens of feed trials since this work began, in 2006. Our research team and partners have been greatly encouraged by the array of new alternatives to traditional wild-caught fishmeal and fish oil. Soy diet feed results: larger kampachi (right) on a soy based diet, the smaller kampachi (left) on a commercial control diet. We have shown that our kampachi will readily accept - and thrive on - a diet where most of the fishmeal is replaced with agricultural proteins, such as U.S.-grown soybeans. Growth performance and health of the fish on the “vegetarian” diet has been equal to or exceeded that of traditional fishmeal-based diets. Our feed trails with soy protein concentrate (SPC; essentially tofu) compared the growth of kampachi on a 40% SPC diet with commercially available diets. After the trials, the fish were harvested and analyzed for product quality in consumer taste tests at Oregon State University. The kampachi raised on the 40% SPC diet diet were indistinguishable from the kampachi raised on the control diet: they were equally delicious! Working with colleagues at USDA, we've also been able to replace some portion of the fishmeal with (a) algal by-products of astaxanthin production, (b) fish peptides obtained by filtering the effluent water from fish processing plants; and (c) single-cell protein concentrates produced by fermenting bio-digesters. We have also shown that kampachi can thrive on a zero fishmeal diet (though the protein products used in these trials were too expensive for commercial grow-out diets). Much of our work is done in collaboration with innovative companies and research organizations. One such example is the clean biotech firm KnipBio, whose single cell protein offers a sustainable fishmeal replacement. Learn more about our collaborations at Kampachi Farms. Graphic of the proposed macroalgae array by our partners, Makai Ocean Engineering. The Kampachi Farms MARINER (Macroalgae Research Inspiring Novel Energy Resources) team is applying for a three-year permit to deploy the Blue Fields Offshore Macroalgae (limu) Demonstration Project. This seaweed demonstration project is proposed to be deployed in the offshore waters adjacent to Pawai Bay and the Old Airport County Recreation Park, in Kailua-Kona, Hawaiʻi. The submersible growing platform will be approximately 1.5 nautical miles offshore and will normally be below the water surface. The proposed demonstration array will be moored to the ocean bottom in approximately 120m (400 ft) water depth, which should mean that there are no significant impacts on water quality, coral reefs, or dolphin resting activity. Kampachi Farms’ Macroalgae research site at NELHA. This demonstration aims to validate technologies that would allow this type of cultivation using only the energy that exists in the natural environment (wind, wave, current, and solar energies). The project will culture only native or endemic Hawaiian macroalgae species. Currently, the suitability of a few native species is being testing in on-shore trials at the Kampachi Farms’ research yard at the Natural Energy Laboratory, in Kona, Hawaiʻi. Read the full Draft Environmental Assessment. We love our kampachi so much that we literally named the company after this superb fish. But our quest for more sustainable seafood means that we also want to be developing additional species, to further soften mankind’s footprint on the seas. We want to help develop the "next big thing" in responsible aquaculture. We are currently working with several other marine fish species at our Kona research site, ranging from plate-sized herbivores such as Nenue (Kyphosus spp., also known as rudderfish), to one of the fastest growing fish on the planet Mahimahi (Coryphaena hippurus), to gargantuan beasts like the highly-esteemed and ecologically threatened Pacific Giant Grouper (Epinephelus lanceolatus), which has been so overfished that is now possibly the rarest coral reef fish in the world. Kampachi Farms – along with many others in aquaculture research - have pursued enhanced sustainability by formulating "vegetarian" diets for carnivorous fish, such as our much-loved Cabo Kampachi™. However, few have focused on the potential for growing a high-quality herbivorous marine fish. Herbivorous fish are less widely appreciated, but in Hawaii a local reef herbivore, the Nenue, has always been prized as a food fish. These seaweed-grazers have a fantastically efficient ruminant-like gut, which allows them to digest and utilize macroalgae (seaweed, or ‘limu’, in Hawaiian). 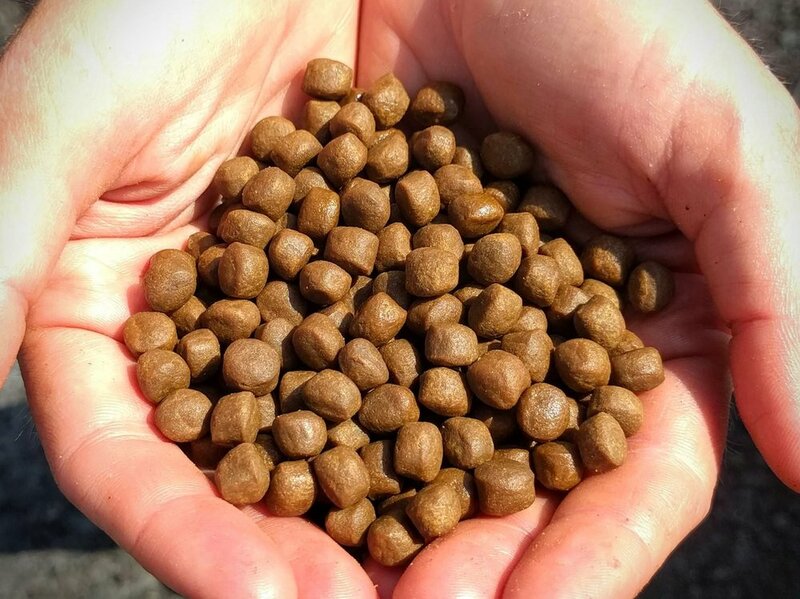 Cultured nenue could therefore potentially be grown on a highly sustainable and economical diet including macroalgae, agricultural byproducts and other plant-based materials. Perhaps most importantly, the fish tastes great and is very nutritious.